Old Handbag = Great Discount! BRIGHTON HANDBAG DISCOUNT STARTS TOMORROW (Friday)! 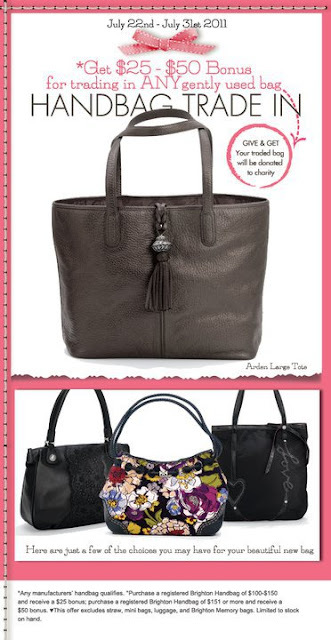 Exchange any gently used handbag for a great discount on a Brighton bag. Your handbags will be donated to SAFE to give to women who come to the shelter with very little. See shop for details or look very closely with good glasses at the fine print in the photo above! Note: Brighton Handbags are available at our N. Wilkesboro shop only.